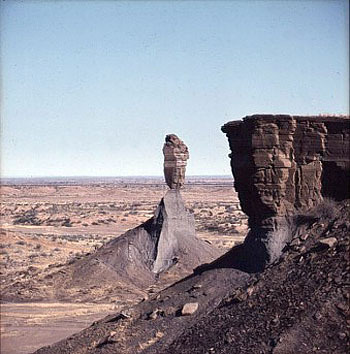 Long before modern man cast his eyes on the fierce cliffs and the rolling hills of the Great Namaquas, a celestial spectacle unequalled in modern times occurred over the Kalahari and South African sky. From the icy depths of space a solid rock of iron measuring roughly 4 x 4 x 3 meters entered the atmosphere of our planet at a low angle of 10° to 20° along a northwesterly trajectory. While still in the upper atmosphere the accumulating drag forces tore the body apart and the meteoroid fragmented in a terminal explosion which rocked the country for hundreds of miles. Dragging fiery trails behind them the fragments and shreds of the cosmic intruder continued their rapid descent. In the plasma jet stream their outer surfaces melted and while the liquid melts were continuously stripped off by the gas stream uneven masses with deep cavities formed. Long before modern man cast his eyes on the fierce cliffs and the rolling hills of the Great Namaquas, a celestial spectacle unequalled in modern times occurred over the Kalahari and South African sky. From the icy depths of space a solid rock of iron measuring roughly 4 x 4 x 3 meters entered the atmosphere of our planet at a low angle of 10° to 20° along a northwesterly trajectory. While still in the upper atmosphere the accumulating drag forces tore the body apart and the meteoroid fragmented in a terminal explosion which rocked the country for hundreds of miles. Dragging fiery trails behind them the fragments and shreds of the cosmic intruder continued their rapid descent. In the plasma jet stream their outer surfaces melted and while the liquid melts were continuously stripped off by the gas stream uneven masses with deep cavities formed. When the iron meteorites hit the savannahs around a then nameless extinct volcano today known as the Brukarros structure, thunder from the terminal explosion rolled across the canyons and plains. Subsequently to his South African journey of almost four thousand miles, James Edward Alexander; Captain in the British and Lieutenant-Colonel in the Portuguese Service, in 1838 published a two volume work with the appropriate title “An Expedition Of Discovery Into The Interior of Africa, Through The Hitherto Undescribed Countries Of The Great Namaquas, Boschmans, And Hill Damaras. Performed Under The Auspices Of Her Majesty’s Government, And The Royal Geographical Society”. Capt. (later General, Sir) J. E. Alexander was not the first to travel up the Great Fish River. Several Dutch colonists, among them W. Van Reenen, went northwards along the river before 1836, but their accounts were never published. 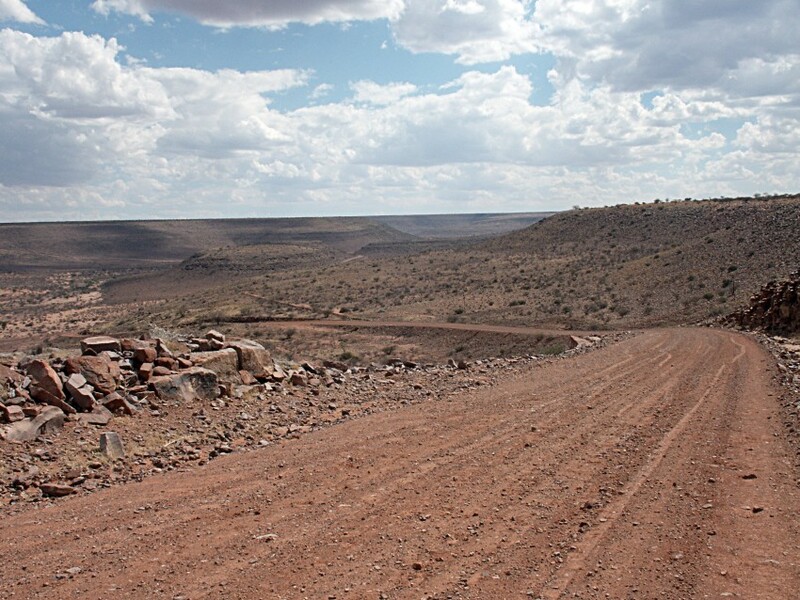 What makes Alexander’s account interesting to us is his mentioning of several specimens of native iron on the east bank of the Great Fish River. Alexander never examined these masses with his own eyes but he was able to obtain a sample which proved the claims of his scouts. Alexander submitted the sample to Sir John Herschel, who then was president of the Literary and Scientific Institution of South Africa. 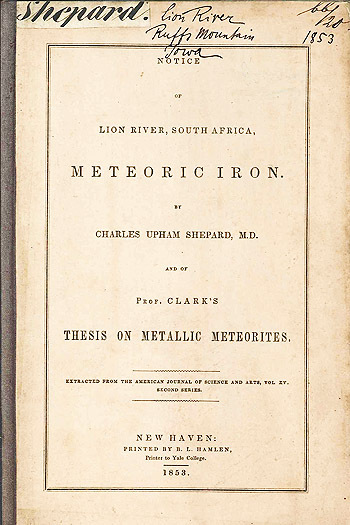 The next important chapter in the history of the Gibeon iron meteorite was opened in 1853 with the publication of Charles Upham Shepard’s Notice of Lion River, South Africa, Meteoritic Iron. 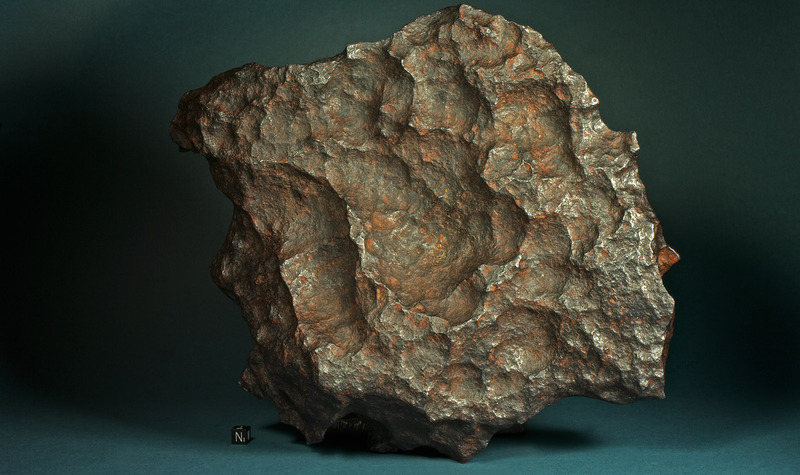 In his work Shepard described the circumstances of the discovery of a 178 lbs mass of meteoritic iron on a clay plain near the Lion River and its subsequent transport by Mr. John Gibbs via ox cart to Cape Town. The meteoritic iron was shipped to London where it was purchased by mineralogist to Queen Victoria, Professor John Tennant, who forwarded it via New York to Professor Charles Shepard of Amherst College in Massachusetts. Additionally Shepard was the first to comment on the find situation of a Gibeon meteorite which was found on the spot where it fell. He described the clay layer, of which he had received samples, as a “compact and hard marl, penetrated by seams of iron-pyrites, which appear to fill spaces once occupied by fossil shells. In 1902 Aristides Brezina and Emil Cohen gave an extensive description of a 178 kg meteorite which was found in 1899 near Mukerop (Mukorob). 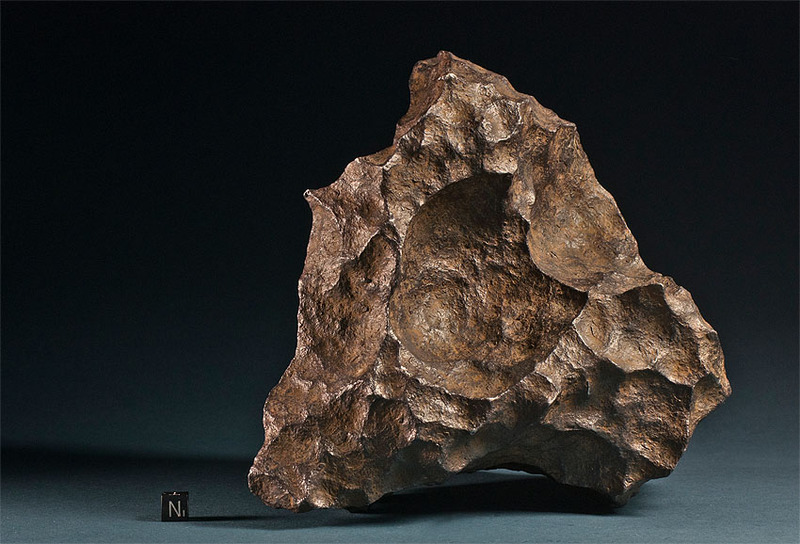 After a cast was prepared the meteorite was cut under supervision of Prof. Fraas into a middle section of 16 kg, and two end blocks of 86 and 61 kg respectively. The cut loss was 15 kg. The 16 kg midsection went to the Naturalienkabinett in Stuttgart and onto the tables of the leading contemporary experts on iron meteorites Emil Cohen and Aristides Brezina. Quickly they arrived at the conclusion that the meteoritic iron was paired with the Lion River mass. After etching the specimen, Brezina noticed that about a third of the cut section produced only a very week Widmanstätten pattern, a fact that he attributed to the thinness of the taenite lamellae and to the homogeneity of the kamazite in this part of the meteorite. As an explanation Brezina and Cohen suggested a slow reheating of the mother body subsequent to its formation and cooling. As accessory parts, the authors describe schreibersite, troilite and graphite. The nickel content is given with 8.19 percent. In providing a synopsis of their chemical analysis with those of the iron meteorites of Bethany, Lion River and Mukerop they concluded that all three finds are paired. In the same year as Cohen and Brezina, Friedrich Berwerth (1902) from the Museum of Natural History in Vienna, published a metallurgical analysis of a Gibeon slice with the dimensions 43 x 31 cm that was also cut from the 178 kg mass examined in the Naturalienkabinett in Stuttgart. 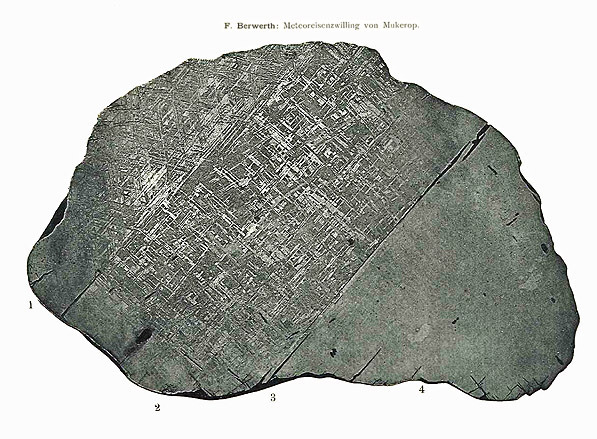 Berwerth provided a photograph of this slice and his analysis resulted in the first discovery of enstatite in the Gibeon meteorite.